The first live viewing period of the NCAA spring recruiting calendar kicked off Friday night at Bishop Gorman High School in Las Vegas with 88 teams in five divisions playing in front of college coaches in selected showcase games. On Saturday, the teams jump into pool play and the viewing period will conclude on Sunday with championship bracket play. Multi-level scorer and one of the fastest-rising senior-to-be prospects in the West had 29 points in his team¹s one-point loss to Elite 24 Black (OR). 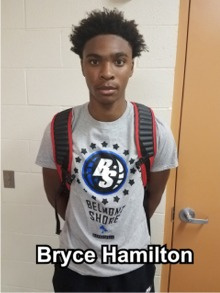 The left-handed Hamilton is one of the youngest prospects (by age) among national top 100 candidates in his class and is the cousin of UCLA guard Isaac Hamilton and pro forward Daniel Hamilton. Maka Ellis (Vegas Elite 2018/Sierra Vista HS (NV) 6-5 2018: His sweet shooting stroke was on display, as he nailed six 3-pointers and finished with 24 points in Vegas Elite¹s 78-69 victory over Factory AZ 17U. Ellis is one of the better shooters in the country and has a plethora of West Coast D1 programs and Ivy League programs in hot pursuit. Trey Woodbury (Vegas Elite 2018/Clark HS (NV) 6-3 2018: Had 15 points in his team¹s 78-69 win over Factory AZ 17U, displaying a unique combination of competitive grit and athleticism around the basket. Woodbury is one of the top candidates from the West Coast to have a breakout summer after a fine junior campaign for one of Las Vegas¹ top teams. Jalen Thompson (Elite 24 17U Black/West Linn (OR) 6-2 2018: This versatile guard made the game-winning field goal in his team¹s 61-60 victory over Belmont Shore, as he nailed a 10-foot contested baseline jumper with approximately 12 seconds remaining in the game. He finished the game with 10 points and impressed college coaches in attendance. Cedric Bridges (Factory AZ 17U/Valley Vista HS (AZ) 6-4 2018: Netted a team-high 22 points in his team¹s loss to Vegas Elite 2018. Bridges can sore in a variety of ways inside the arc and is a competitor. His point total didn¹t include any 3-pointers. Other standouts included 6-3 2020 guard Daishen Nix of Simply Fundamental Basketball Academy (NV)/Trinity International (NV), 6-5 2019 shooting guard Otis Frazier of Arizona Dream Team Elite/Buckeye Union (AZ), 6-4 2017 small forward Justin Holiday of the Las Vegas Punishers (NV)/Rancho (NV) and 6-4 2017 small forward Kyle Fischer of AZ United/Team Bayless/Sunnyslope (AZ).